The Ribbon of Courage is a stamp set that will be available in the new 2017-2018 Stampin’ Up! Catalogue. See this post earlier this week for Part One of this post which includes the background story on this stamp set. And my last and final post on this stamp set will be early next week. The stamp set was primarily meant as “Cancer” stamp set with several ribbons in and in the matching dies. But the stamp set also has some lovely sentiments and other elements, like the heart on this first card. I stamped the heart then cut it out (there is a matching framelit coming too) and then I coloured it in with markers. And I added some Wink of Stella (clear) to all the elements. I also added a rhinestone to the largest flower on the heart. 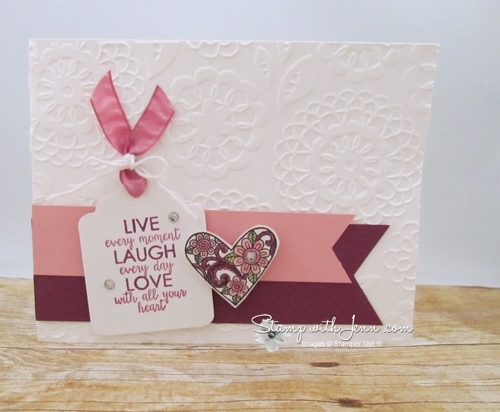 The saying was stamped first in Sweet Sugarplum ink and then, before stamping, I inked up just the ‘Live, Laugh Love’ words with a Rich Razzleberry marker. Love this two-toned effect on a stamped saying and especially this stamp set with the two different fonts. This could easily be a wedding or an engagement card or just a “thinking of you card”. Colours (love this colour combination!!) on this card are: Blushing Bride, Sweet Sugarplum, Rich Razzleberry and Whisper White. On this second card, I also used one of the wonderful sayings from the Ribbon of Courage stamp set and embossed it with white embossing powder. I used the Irresistibly Floral Designer Series Paper on this card (it is on the retiring list and only available while supplies last!) This time I embossed the saying in white. I used Stampin’ Up!’s Sponge Brayer to colour this paper with Calypso Coral and Melon Mambo inks (love this bright colour combo!). 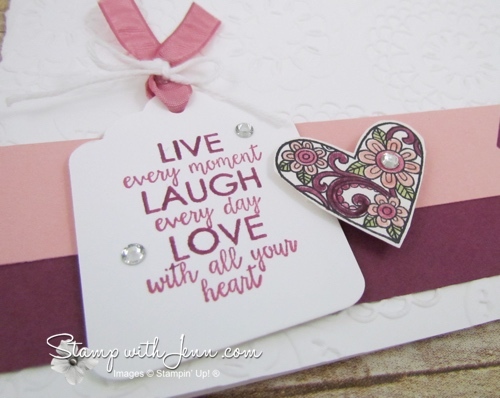 See this post here with a VIDEO on how to make a card like this. 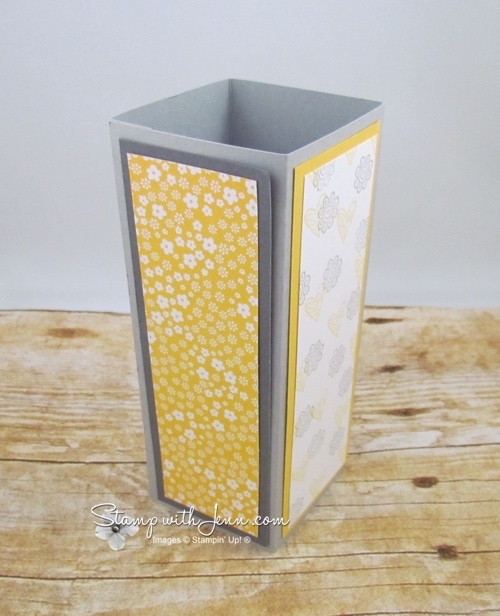 The die cut flower is from the May Flowers Framelits (love how it matches the DSP). When the Ribbon of Courage stamp set comes out in June, I would use the gorgeous flower die cut that will be part of the bundle. Want a unique looking card? 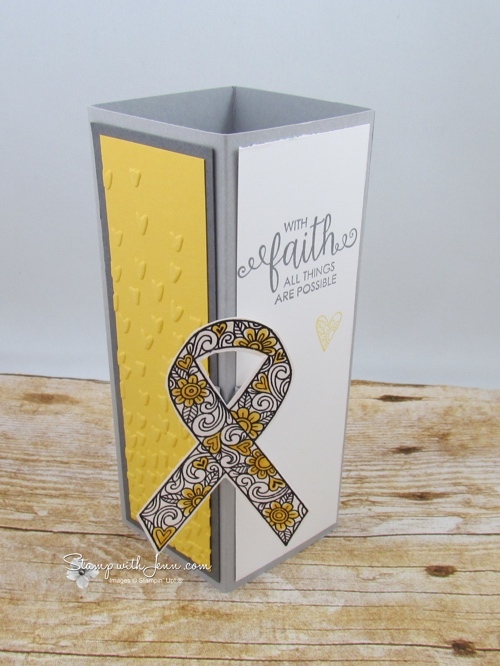 Try this 3D card done with the Ribbon of Courage stamp set. I made this card and ribbon with yellow accents for “Support the Troops”. 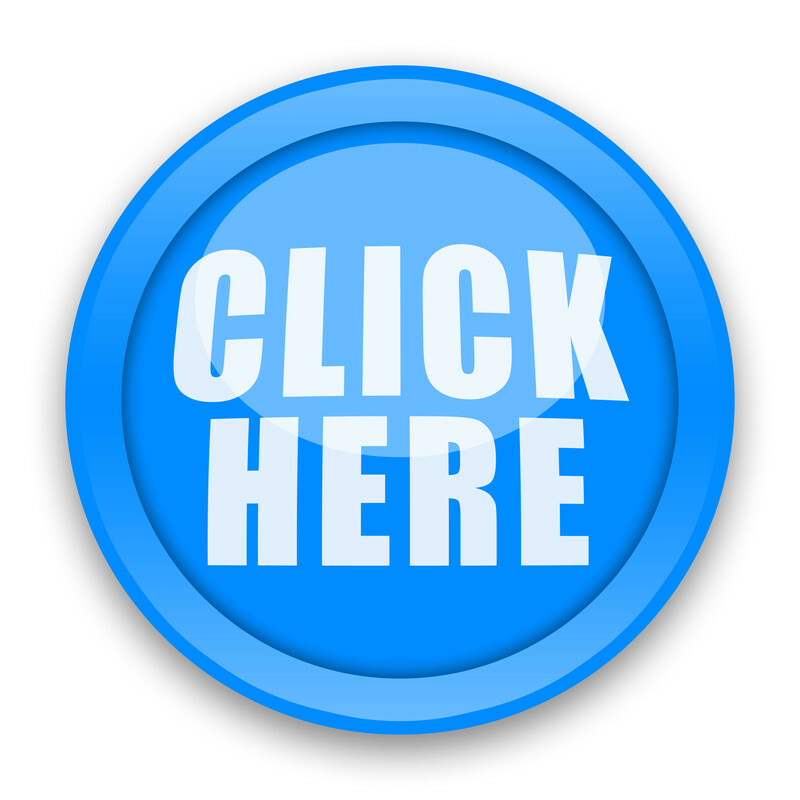 You can see other awareness ribbons colours here. Despite looking complex, this is an easy card to put together. You just need the measurements and a few simple instructions, which I’ve got for you a downloadable and printable format at the end of this post. 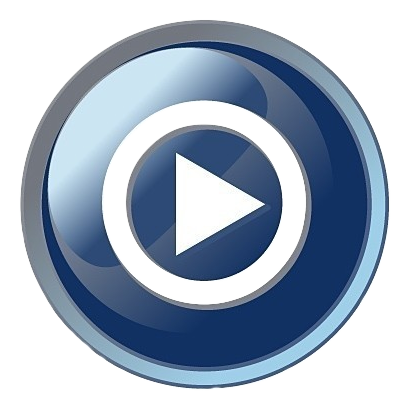 Just scroll to the end of the pictures for the link for the measurements. 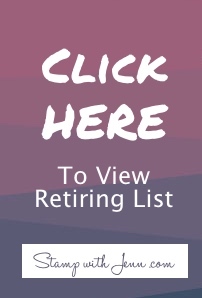 Just click HERE to save this document. 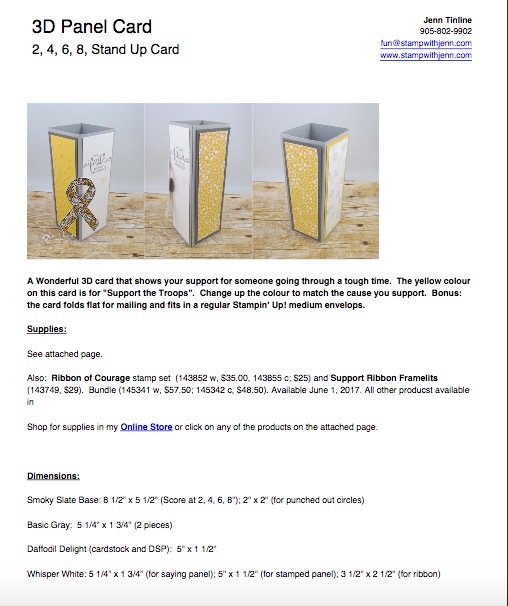 It includes pictures, supplies, measurements and instructions. Be sure to check back to www.StampwithJenn.com next week for my Part 3 post on card ideas for the Ribbon of Courage stamp set.